Amazon Echo Dot (3rd gen) vs. Google Home Mini: Which is better and which should you buy? We're a virtual company made up of tech experts from across the globe. We live and breathe smart home technology, so if you're just stepping into this exciting new tech space, we're here to help set you in the right direction. The re-designed Echo Dot is slightly larger and more rotund than the previous generation with a bigger speaker delivering better sound. You're also able to connect your own speakers via Bluetooth or 3.5mm audio cable. Supports speakers with Bluetooth or 3.5mm connection. Fresh design with a fabric finish. Easy to connect multiple Echo speakers. Lacks some features found in larger Echo speakers. The Google Home Mini is a perfectly acceptable option for a compact smart home speaker — it just lacks some of the refinement that Amazon has developed over three generations of products. Control Chromecast with your voice. No wired support for connecting external speakers. Both the Amazon Echo Dot and Google Home Mini are positioned as the most affordable smart speakers in their respective lineups. They're perfectly capable for general use on their own, but work best as part of a network of connected speakers set up throughout your home. Which speaker you opt for is going to largely depend on whether you already own another Amazon Echo or Google Home speaker, as there's no cross-compatibility between the Amazon and Google ecosystems. If you're coming in fresh and are open to adopting either AI assistant, the Amazon Echo Dot is objectively the better hardware product, but anyone using an Android phone has likely grown quite familiar with the Google Assistant. Amazon announced an impressive line of products alongside the new Echo Dot, so it's worth checking out what other smart home stuff will be compatible as that just might be enough to sway your opinion. Purely in terms of hardware, the Echo Dot is our pick between the two. Size 3.9" x 3.9" x 1.7" 3.85" x 3.85" x 1.65"
There's so much in common between these two products that hashing out the differences essentially comes down to brand loyalty. Both Amazon and Google offer great support for an ever-growing list of connected smart home device to control your lights, lock your doors, and control appliances around your home. Both the Dot and Mini are perfect for bedrooms for setting alarms and delivering morning briefings or anywhere else in the house where you could make use of a voice-controlled assistant. Either speaker can be paired with brand-specific smart TV dongles or set top boxes for controlling home entertainment, and both cost around $50. But the biggest differentiation is the Echo Dot's ability to let you connect better speakers. 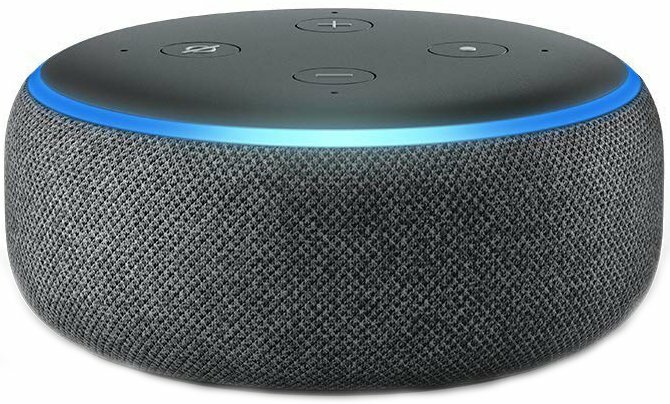 Both the Echo Dot and Home Mini are designed to sound great given the compact size and both allow you to connect Bluetooth speakers for a sound quality upgrade. With the Echo Dot, you're able to connect more substantial speakers via both Bluetooth and 3.5mm audio cable (not included) and enhance the existing speakers you own with the power of Alexa. As it stands, the Google Home Mini is still a great option but lacks some of the hardware features found in Amazon's product. If you love using Google Assistant on your phone, this is the one you should get.